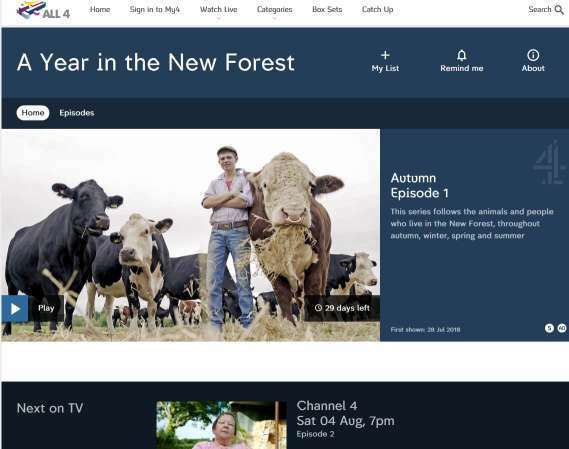 It may be difficult to quantify why Channel 4’s new documentary series A Year In The Forest is such a uniquely rich and well observed celebration of what makes our Forest so special. Sure, there’s abundant beautiful photography, but we should expect this in a 7 pm Saturday flagship documentary slot. The filmmakers took their time with this, literally a year and change, and have produced an episode per season of that year for a set of four. The filmmakers have avoided pitfalls of previous efforts, no celebrity CNP figureheads up in hot air balloons, no gross oversimplifications, no — as certain BBC magazine programmes past have done — touting of inappropriate recreation activities (there was some regrettable habitat disturbance intentionally running through bogs for some mucky version of orienteering). Its success may lie partially in what they leave out. Last names, for starters, all the “leads” in focus are only referred to by their first names, this has the effect of making the discussions more intimate and personal. A last name is dropped in a description of a family heritage going back to 1680, you may spot a familiar commoning name on an erstwhile bucket, and a side character local mycologist is anonymised when joining “Richard” for a fungi ID hunt (her name passed in conversation). In focusing on individuals they’ve also skirted or left out larger group activities, hard to imagine a doc on Autumn in the Forest without a chunk about the Drift or Beaulieu Rd Pony Sales (will Winter include the Point-to-Point?). There’s also a lack of official talking heads from the statutory organizations, the National Park Authority, the Forestry Commission (The Forester featured is not even from the FC, but from the excellent Pondhead Conservation Trust which manages their inclosure sympathetically under lease from the FC), or even the Verderers. We’re not being lectured at, we’re being spoken to. This works well in conveying the love and care for the Forest from all those involved, but excludes any prescriptive suggestions on how to protect it. An incident of a dog chasing deer, resulting in a drastic change to mating patterns, amongst other things, passes without any comment on the behaviour of the dog owner. The foray for autumn fungi is not concluded with any message to not pick (which I’m certain will have irked at least one participant). As a campaigning organization, we know it’s often difficult to express precautionary principles without falling the wrong side of hectoring, but these few moments begged a slight nudge at least, although this may have not fit with the welcoming tone the narrative affects. At the same time they don’t utterly shy away from hard realities, TB tests are endured and acclimatizing young stock to coming Winter requires a firm stance that may not sit well with those ready to misunderstand animal welfare. A Year In The New Forest is produced by Blast! Films for Channel 4 and airs on Channel 4 on Saturdays starting 28th July at 7pm, and available on All 4 Catch-up Apps for 30 days each. Error: Error validating access token: Session has expired on Sunday, 10-Mar-19 01:16:56 PST. The current time is Tuesday, 23-Apr-19 11:09:53 PDT.